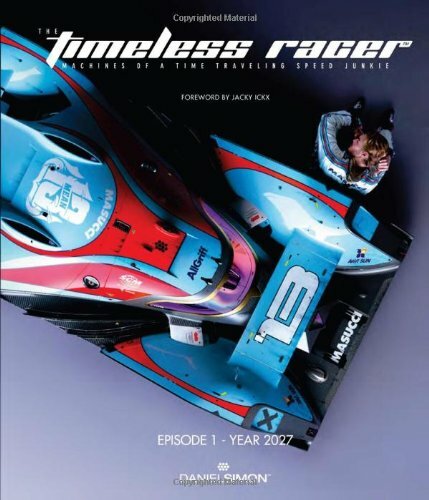 Daniel Simon who put out the amazing vehicle concept art book Cosmic Motors in 2007 is finally back with a new book in The Timeless Racer. After Cosmic Motors was published, he has went on to work on films like Tron: Legacy, Prometheus, Marvel's Captain America and Oblivion. The Timeless Racer is Daniel Simon's personal project, one that he took time off in 2011 from movie work to create. It's a cumulative of 4,500 hours of work in the book. It's a big 12 by 14 inch hardcover book. The beautiful cover is of matte smooth surface. There are only 72 pages so you'll most likely be left wanting more after looking at the amazing visuals and work inside, and also if you compared it to the 176-page Cosmic Motors. The book is designed like one of those luxurious picture books on race cars and legends. In this case, we are introduced to the world of futuristic racing with a time-traveling race driver Vic Cooper, and his record-breaking team Masucci. The visuals are created with a blend of photography and 3D renders. The huge canvas of the book really shows off the detail and beauty of the cars. The gloss, decals and designs are just wonderful. There are also some schematic concept sketches. The designs of the cars are like super evolved F1 race cars but sleeker. They are not exactly sci-fi designs but feel real enough that they could be from the future. Even the photo shoots are handled with attention to detail with custom made costumes, and even in one picture, some girl was wearing a pair of headphones, on them were printed with Masucci logo. Vic Cooper's boots are also stamped with those logos. Look at the photos carefully to spot all these little details. Towards the back, there are also some race track layouts, and behind-the-scenes photos on how the photos were created. It's an artbook of stunning visuals. Note that in addition to the standard hardcover edition, there are also the limited slipcase edition and an even more limited Pitlane-club edition. Those would be available on publisher Design Studio Press website. The books come with English, French and German text. And there's a Japanese edition as well. In addition to the standard edition, there are the limited editions, namely the Limited Edition and the Pitlane-Club Edition. They are also available at Design Studio Press website. Here's a video explaining the differences between the editions.